"Stanley inhabits a world of inadequacy and self-delusion, a recluse with the doors tightly shut against the menace that could blow in on the air. It soon arrives, in the form of the mysterious Goldberg and McCann, malign agents of state and religion. Nothing can be trusted, not even the date of Stanley’s supposed birthday, more probably, as hinted in Michael Cabot’s searching production, the birthday of a dead or imaginary son of his landlady Meg. The sense of living on the edge of disaster is palpable, and the demons are the more terrifying for being without name. 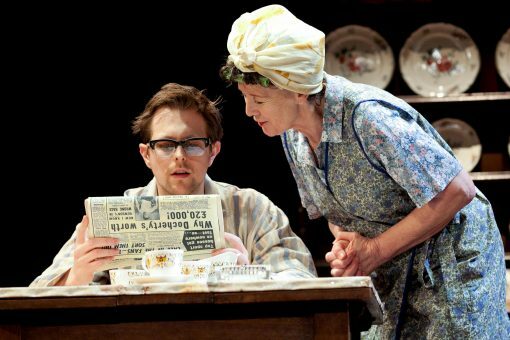 Gareth Bennett-Ryan is haunting and haunted as Stanley, a dish-cloth of a man being squeezed dry, and Cheryl Kennedy has an affecting fragility as Meg. Jonathan Ashley and Declan Rodgers as the chillingly cheerful Goldberg and cheerless McCann ratchet up the torture with their increasingly extreme and absurd allegations, nightmares of poor Stanley’s own invention. 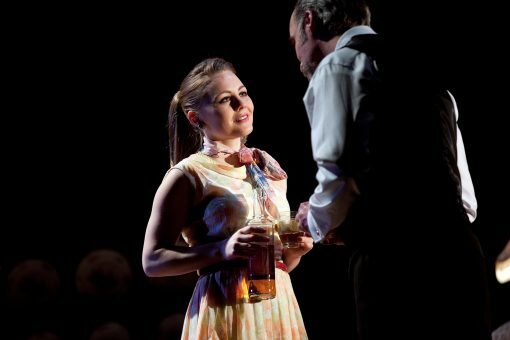 Imogen Wilde as Lulu and Ged McKenna as Petey complete an impressive cast." 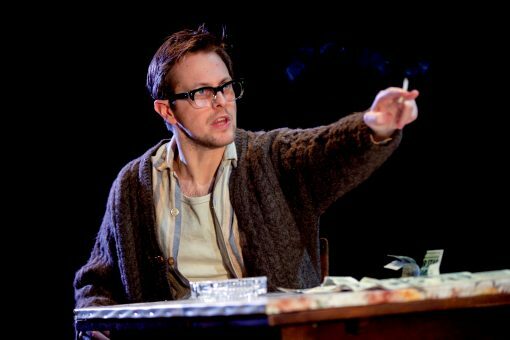 "London Classic Theatre’s revival of The Birthday Party makes for a funny and chilling evening. The pairing of comedy and unsettling drama is not a natural one, but this Harold Pinter classic, directed by Michael Cabot, pulls it off. This cast are at their strongest when playing against each other and exploring the internal dynamics of the play. The comfortable companionship of Meg and Petey is absorbing. Gareth Bennett-Ryan, playing Stanley, successfully distorts all of his interactions with other characters into a snapshot of his own deteriorating mental state. The titular birthday party is an explosion of power struggles, fuelled by whiskey and taking unsavoury characteristics to disturbing proportions. On-stage rapport is especially present when involving Kennedy’s expertly delivered Meg." 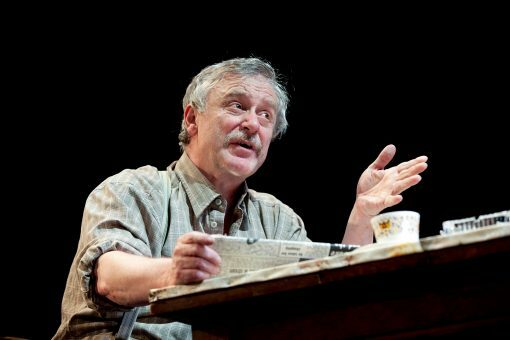 "Brought to Cork by London Classic Theatre, this is a tense production with occasional flashes of humour. It keeps you on the edge of your seat with its twists and turns, sometimes serving as clues as to what lies beneath. This is theatre of menace with its overhanging elements of intimidation and allusions to sinister goings on. It’s both a thriller (without a resolution) and a strange macabre farce. The production is highly polished and manages to sustain tension throughout." "London Classic Theatre bring this classic skilfully to life. Production values are intelligent and imaginative: the set is a kind of platform, raising the action to a little parallel world, two or three feet above reality - but beneath the platform you glimpse skulls and skeletons, like some medieval vision of Hell. Nihilism, but laced with vivid menace. Failed concert pianist Stanley, the outstanding Gareth Bennett-Ryan, exists rather than lives, fearful of the world outside and mothered by Cheryl Kennedy’s hapless, neurotic landlady and her husband (Ged McKenna with fleeting glimpses of actual normality). Young Lulu, an engagingly enigmatic Imogen Wilde, pops in and out with no discernible purpose. Then two insidious arrivals shatter the tedium: the cold, controlling Goldberg and brutish, explosive sidekick McCann - superb and gripping performances from Jonathan Ashley and Declan Rodgers. There is comedy, but it is always nervous laughter and the actors can twist it in an instant to a dark menace that echoes Kafka. There is threat behind every line, and fear in every shadow. And where does it lead? This is no easy ride for audiences, who instinctively want a story that resolves and an outcome that satisfies. Instead the plot is elusive, veering in new directions every time you think you are grasping it. Drama always holds up a mirror to life and to human nature. Pinter’s is a distorting mirror, unnerving and grotesque. When theatre does not challenge, explore, push boundaries, it dies. The Birthday Party does not show us theatre as it should always be, but it shows us where theatre has the capacity to take us. Brilliant." 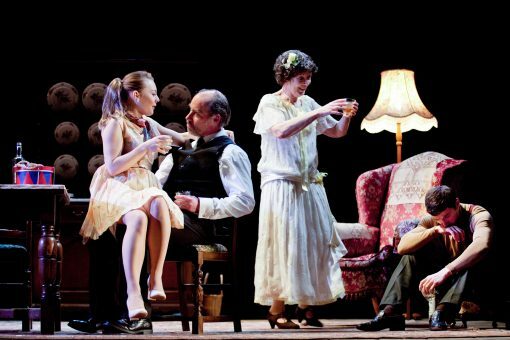 "The Birthday Party was Pinter’s second full-length play. Not a success in its day and still unsettling and confusing more than half a century on, but it has become a classic, worthy of inclusion in London Classic Theatre’s pantheon. Michael Cabot’s new production is a taut, intelligent reading of the text, respectful of the dark mood behind even the most trivial interchange. Set on a raised platform, reminiscent of a boxing ring, it’s a minimalist, realistic set by Bek Palmer, with a suggestion of skeletons beneath the floorboards. A fine cast, led by Cheryl Kennedy’s frustrated, fussy, flaky Meg, hinting at a more glamorous past behind the slovenly landlady in fluffy slippers and head-scarf. The belle of the ball, she recalls at the end. Gareth Bennett-Ryan is the weak, spoiled loner Stanley, cosseted by Meg (the little boy she’d much rather have, perhaps), deliberately destroyed by the manipulative Goldberg and McCann in one of the strongest scenes - Pinter’s use of language as a weapon never bettered. Broken by the two intruders whose coming upsets him from the start, he ends up a catatonic wreck, his hands jerking and twitching as if he still had his toy drum, Meg’s musical gift for his birthday. Jonathan Ashley is all smooth menace as the laid-back Goldberg, with Declan Rodgers as the solid, silent McCann - muscular torso, red braces. Both strikingly still in contrast to their victim’s nervous movement. Like Ben and Gus in The Dumb Waiter, they are a double act sent to do a job. Absent from the party is Meg’s old man, the lumpen deck-chair attendant Petey, seemingly uninterested in anything beyond the morning paper and his night out with the lads from the chess club. He’s played with genial indifference by Ged McKenna. The piece is an unsettling blend of sitcom and the theatres of the absurd and of cruelty. A more intimate space might draw us in more successfully to the banal, claustrophobic world of the seaside boarding house - if that’s where we are. But this stylish production deftly lays bare the frightening forces behind the stuccofaçade – a welcome reminder of one of 20th century’s most accomplished British works for the stage." CAST: Jonathan Ashley, Gareth Bennett-Ryan, Cheryl Kennedy, Ged McKenna, Declan Rodgers, Imogen Wilde. SELECTED VENUES: Cheltenham Everyman; Gaiety Theatre, Dublin; Coventry Belgrade; New Vic Theatre, Newcastle-under-Lyme; Oldham Coliseum; New Wolsey, Ipswich; Theatre Royal, Bury St Edmunds. By turns, cryptic thriller and macabre comedy, The Birthday Party was Harold Pinter’s first major work and is among the most unusual and absorbing of his plays. London Classic Theatre presents the first significant touring revival of the twenty-first century, promising to bring fresh life to this ground-breaking classic. Playwright, director, actor, poet and political activist, Harold Pinter was born on 10 October 1930 in East London. 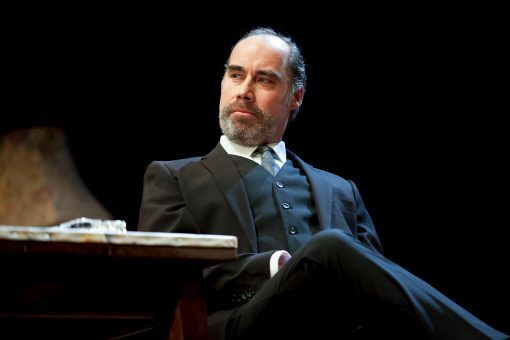 He wrote twenty-nine plays including Betrayal, Old Times, The Homecoming and The Caretaker. In 2005, he was awarded the Nobel Prize for Literature. He died on Christmas Eve 2008.